"Minor Miracle On The Obi"
First flown in 1959, over 1,000 An-24s were built and 880 are still in service worldwide, mostly in the CIS and Africa, with a total of 297 Antonov An-24 aircraft in airline service, as of May 2010. Due to its rugged airframe and good performance, the An-24 was adapted to carry out many secondary missions such as ice reconnaissance and engine/propeller test-bed, as well as further development to produce the An-26 tactical transport, An-30 photo-mapping/survey aircraft and An-32 tactical transport with more powerful engines. Various projects were envisaged such as a four jet short/medium haul airliner and various iterations of powerplant. The main production line was at the Kiev-Svyatoshin (now "Aviant") aircraft production plant which built 985, with 180 built at Ulan Ude and a further 197 An-24T tactical transport/freighters at Irkutsk. Production in Ukraine and the USSR was shut down by 1978. Production continues at China's Xi'an Aircraft Industrial Corporation which makes licenced, reverse-engineered and redesigned aircraft as the Xian [Yunshuji] Y7, and its derivatives. Manufacture of the Y7, in civil form, has now been supplanted by the MA60 derivative with western engines and avionics, to improve performance and economy, and widen the export appeal. 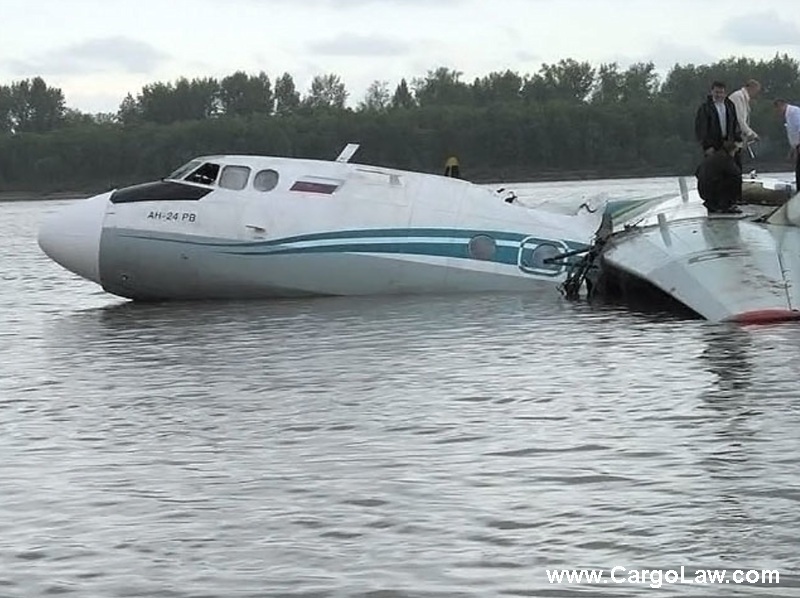 There are at least 46 crashes recorded for the Antonov An-24. 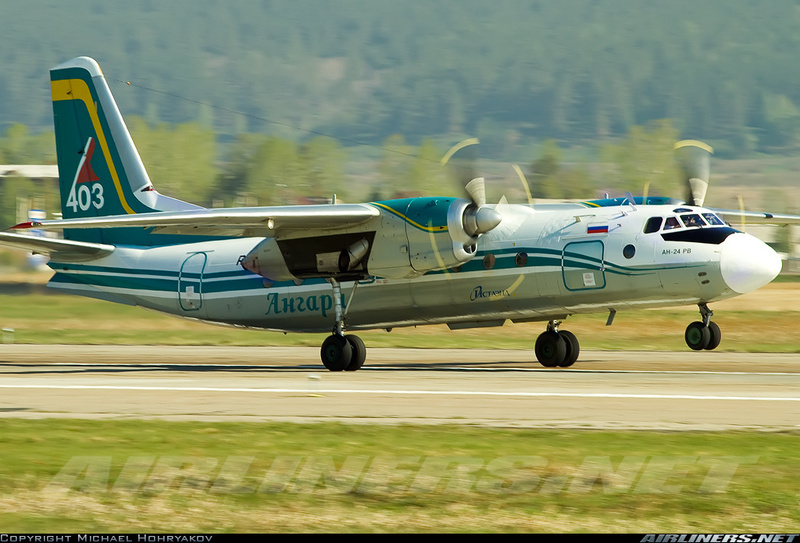 in the Air Disaster web site database, and 46 crashes recorded for the Antonov An-24. The Antonov An-24, which was given the NATO reporting name "Coke", is a 44-seat twin turboprop transport designed and manufactured in the Soviet Union by the Antonov Design Bureau from 1957 to 1979. 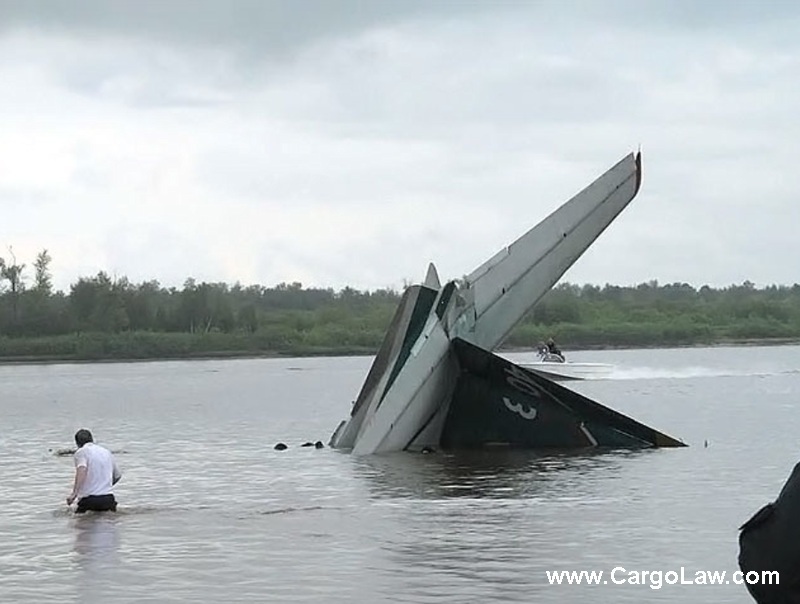 According to an entry in Wikipedia, there have been a total of 109 hull loss accidents, which resulted in a total of 1,673 fatalities, and 11 other incidents with a total of 59 fatalities. Other published reports indicate the aircraft has been involved in 1,971 recorded fatalities in 134 accidents since first being used in commercial flights. The Antonov An-24 carries a crew of 3-4, up to 52 passengers depending on version, has a maximum takeoff weight of 46,000 pounds, has a maximum speed of 310 mph, a cruising speed of 280 mph, and a service ceiling of 27,559 feet. We will never forget the January 2009 "Miracle On The Hudson" when US Airways Flight 1549 survived it's 3 minute flight -- and was successfully landed in the Hudson River of New York with the courage and skill of Captain Chesley B. Sullenberger, III. The "Miracle" was simply stated: there were no fatalities. Captain Chesley B. Sullenberger, III performed the improbable! Just 42 days later there was to be the "Miracle At Schipol" As Captain Hasan Tahsin Arisan brought his Turkish Airlines B737-800 down in a muddy farming field, short of a safe landing at Amsterdam's Schiphol International Airport. Miracle? Again, that's the only definition when 127 souls survived a horrendous impact from which no one should have walked away. Actually, about 30 of the 127 survivors did just that -- walked away with no deaths. Our Photo Feature: "Miracle At Schipol"
Our Photo Feature: "Miracle At Kingston"
Indeed, 2009 was the year of aviation miracles! By 2011, some of this amazing luck has apparently weakened. 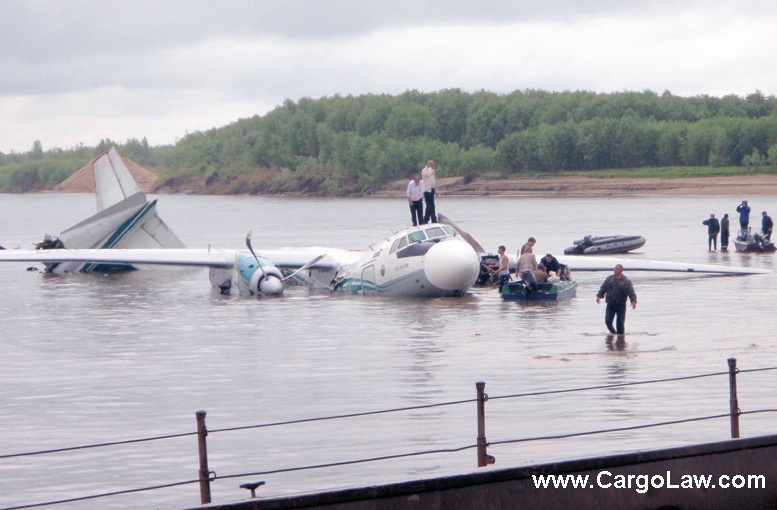 On Monday, July 11, 2011 a Russian built Antonov An-24 twin engine turboprop aircraft, registration RA-47302, built in 1975 and operated by Angara Airlines (IK), made an emergency water ditching crash landing at 11:55 a.m. local time on the Obi River in western Siberia after the plane's left engine caught fire. 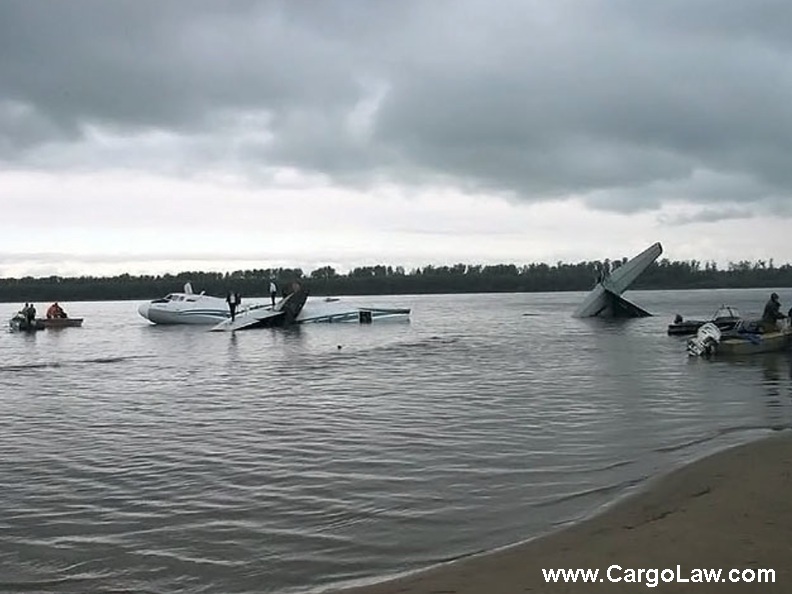 Of the 33 passengers, including 1 infant, and 4 crew members -- 6 persons died at the scene, and 30 persons were injured, 18 of whom remain hospitalized. Russian Federation President Dmitry Medvedev praised the flight crew for their skills in minimizing fatalities, but instructed the government to consider the possibility of early retirement of all An-24 planes. The last such model was produced in 1979. Not all the passengers survived -- but by any measure -- it was at least a "Minor Miracle". This feature deals with two concepts:"Minor Miracle On The Obi River" ........ and ....... of course ....... as always ....... "Ship Happens! ©"
Engine Trouble & Fire ForThe AN-24, Prompted Diversion To Nizhnevartovsk or Strezhevoy. Angara Airlines Flight TSK-5007 was traveling between the cities of Tomsk, one of the oldest towns in Siberia, and the northern Siberian city of Surgut. 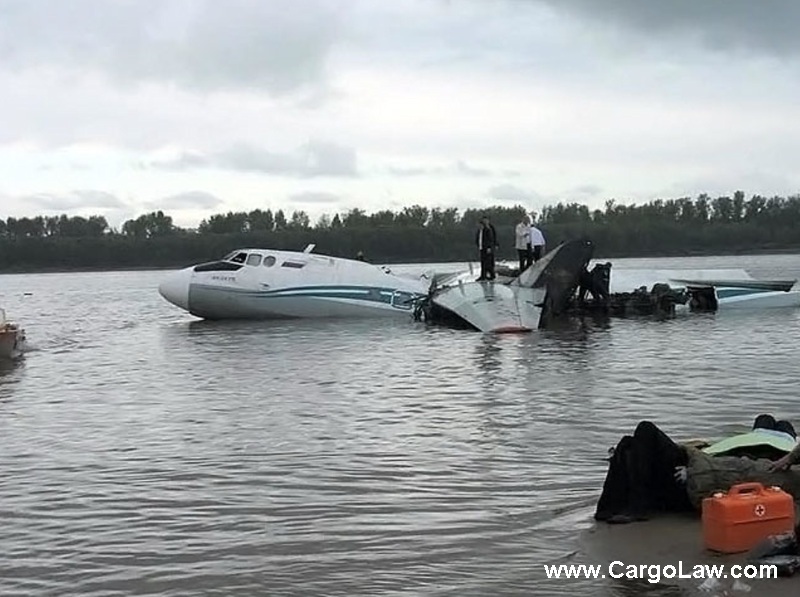 Following an engine fire, the aircraft crashed on the Obi River, near Medvedevo, on the border between the Tomsk and Khanty-Mansiisk regions of Russia, 9 miles from the town of Strezhevoy. 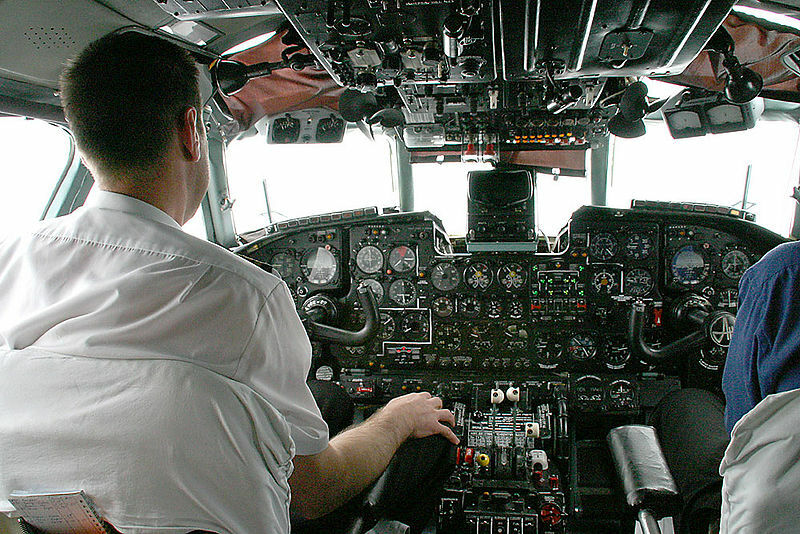 Flight Deck of A Typical AN-24 Aircraft Courtesy of Wikipedia. The Stricken Aircraft Tail Number RA-47302 Last Received A Full Overhaul In 2006, According To Angara Airlines. How Could Anyone Have Survived? 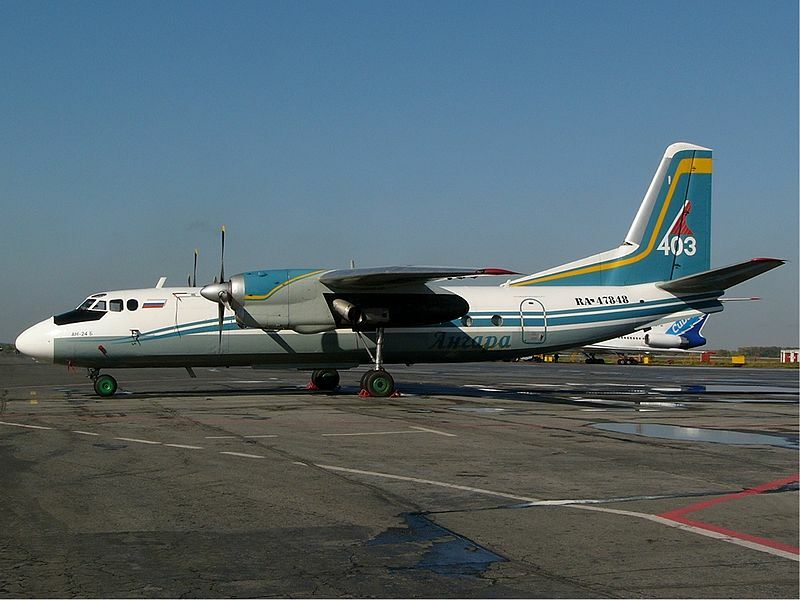 Fire Engulfed The Port Engine of The AN-24, Prompting Diversion To Nizhnevartovsk or Strezhevoy. Seven Minutes Lates Pilots Decided To Ditch In The Obi River, About 1.6km Off Medvedevo. Local Citizens Were The First Responders. The Obi River Is The Seventh Longest In The World. According to an entry in Wikipedia, there have been a total of 109 hull loss accidents for the AN-24, which resulted in a total of 1,673 fatalities, and 11 other incidents with a total of 59 fatalities. Other published reports indicate the aircraft has been involved in 1,971 recorded fatalities in 134 accidents since first being used in commercial flights. Tickets for future flighs are being deeply discounted. Get Your "Ship Happens! ©" Gear! Visit The Cargo Law Ship's Store For Great Industry Gift Ideas! Get Your "Ship Happens! ©" Shirts, Hats & Other Cool Gear! The Dedication of This Feature Is Simple: To The Pilots & Crew of Angara Airlines Flight TSK-5007 And Their Very Lucky Families. The Cargo Letter appreciates the continuing efforts of these valued contributors.